Eyeron™ is a quality improvement tool that captures and analyzes data from all processing lines. It was crafted by Fives’ experienced metallurgists to resolve quality control challenges throughout the steel process. It can be adapted to the customer’s needs, offering customized modules and rules according to requirements. The data is crunched to give quality teams a clear view on process issues and decision making on products. Greater visualization of the process enables an improved understanding of where inefficiencies and problems are likely to occur, giving quality teams the chance to avoid them and benefit from a streamlined process. This data is then used to suggest smart solutions to metallurgical problems, resulting in increased productivity, greater efficiency and improved quality. By generating a potential quality yield increase from 92% to 95% in a year, with six times faster troubleshooting, the ROI is significant. Centralization of all signals and measures, compilation of all production data, product characteristics and measurements and a linear display provision. Complete product history tracking, including manual operations. Summary of events/alarms, including identification of significant events encountered by the product, displayed according to criticality. Import of data and images from the SIS (Surface Inspection System), which can be displayed in parallel to give an overall view of defects and signals. A range of statistical analyses functions are also available as part of this feature. Eyeron™ carries out coil grading, utilizing rules for product qualification based on criteria from clients, application, process, etc. Automatic proposition for reallocation of products deemed non-compliant, interfaced with the ERP. Reallocation parameters are editable by the client for each process step. Classification of products by production line and date as standard. Instantaneous filters are applicable to any production data available in the application, such as thickness. Data can be extracted as a .csv file and interfaced with other database/web services to perform statistics and other specific tasks. Historical data can be compared to signals in the application, and there is also the capability to analyze long-term trends. Reports generated by Eyeron™ can be customized according to the user’s needs. Typical reports include quality reports, line performance, sensors performance, etc. 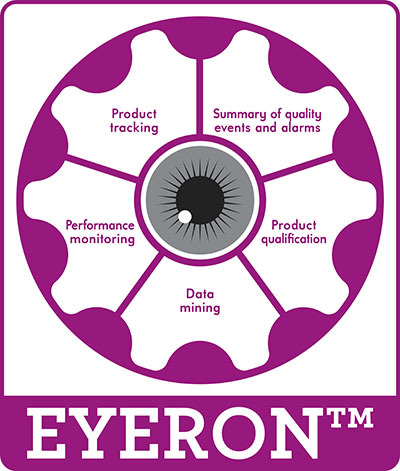 Eyeron™, as a web-based tool, is available anywhere in the plant network. Supported by Internet Explorer, Chrome and Firefox, the application provides unlimited data collection for unlimited users.